I posted yesterday about the cyclic nature of the stock market, and I wanted to take some time today to go into further detail about market cycles. 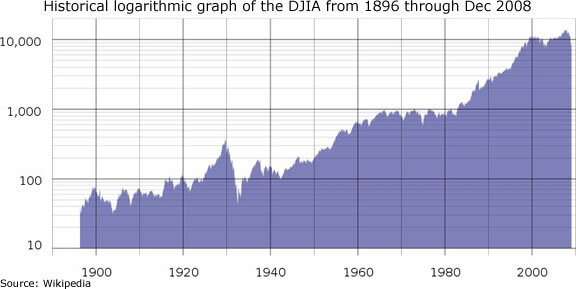 If you look at a historical chart of the Dow Jones Industrial Average, you see that the motion of the stock market is far from smooth. The gradual climb of the market over the past century is comprised of countless bull and bear markets spikes and dips. But the most important thing to understand, as I explained yesterday, is that the market does not move on its own. The market moves because of the mindset and actions of individual investors. The market is not a living being, and it does not have a consciousness. The motion of the stock market is a manifestation of the collective consciousness of all its shareholders. In other words, the thoughts, emotions, and actions of each individual shareholder add up to produce the stock market. The stock market can seem like a very complicated and intimidating concept. But if you can understand the thoughts and actions of the typical trader, you can understand the entire stock market. …As I have said before, a stock’s price is determined by how much investors believe it is worth. While the market may be efficient in pricing stocks to investors’ perceived values, the investors themselves are not nearly as efficient in figuring out how much a share of stock is worth to them. The psychology of investing in the market is the reason so many opportunities are created. One of the most helpful graphics I have come across over the past few years is the chart included below of the investor sentiment cycle. Remember that Warren Buffett said, “Be fearful when others are greedy and greedy when others are fearful.” The wisdom of this quote can easily be understood when looking at the investor sentiment cycle graphic. There are two sides to the stock market: an analytical side and an emotional side. No matter how good you are at analyzing stocks, if you cannot control your emotions throughout market cycles, you will inevitably lose your money. One of the reasons why so many people claim that the stock market is “rigged” or “fixed” or “unfair” is that our normal human emotions tend to lead us astray when it comes to stock trading. Once you remove your emotions from your trading, it is much easier to recognize the opportunities when other traders are virtually throwing fistfuls of their money at you because they are blinded by fear or greed. Anyone can use the methods I learned and included in my book to harness their emotions and maintain the appropriate discipline throughout market cycles. I don’t have a degree in finance; I have a degree in neuroscience. You don’t have to predict what stocks will do if you can predict what traders will do and be one step ahead of them. I made a 400% return in the stock market in five years using only basic principles of psychology and common sense. To read about how I did it, check out my book, Beating Wall Street with Common Sense, and stay tuned to tradingcommonsense.com!